This week instead of doing a Teaser Tuesday I thought I would share with you my latest book review from off of Goodreads. 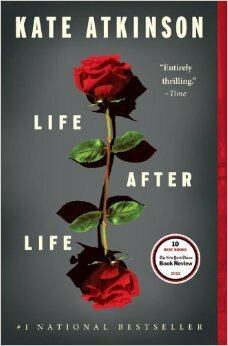 I read Life After Life by Kate Atkinson. It’s a clever premise but ends up feeling more like a gimmick by the end. I didn’t hate it but didn’t love it either. It’s about a woman who repeats life over and over again. Sometimes she dies as an infant, sometimes as a child. Sometimes she is raped as a teen, sometimes she has affairs, sometimes she shoots Hitler in 1939. That’s quite the deviance! I think it would have been better if Ursula had learned more from each life. In the end it feels more like a soap opera with a vaguely time travel element. But not a total loss. Some people will see 2 stars and think ‘how can you hate this book Rachel!’. According to Goodreads 2 stars means ‘it’s ok’ and that’s exactly how I felt about this book. It’s just ok. I didn’t hate it and I didn’t love it. It’s just ok.
It’s definitely a creative premise. It’s kind of Edge of Tomorrow in WW2 era (wrap your mind aroudn that statement!). But once you get over the unique premise it starts to feel more like a gimmick than a truly good story. After all, how interesting is Ursula really in all of her lives? She’s ok but nothing special. She does kill Hitler in a life but even that is kind of a footnote. Most of the lessons she learns seem to be how to either not die as a child or not be with a terrible man. That’s not as compelling as killing Hitler. I certainly hope if I relived my life again and again I would make better choices than Ursula does. Perhaps Atkinson is trying to say something about fate and destiny but it ends up being kind of meh. Still she’s not a terrible writer and there are some engaging sequences. The gimmick has some novelty so I’m glad I read it. It might actually make a better movie than book. I think in a movie you could do things visually that might help it not feel so repetitive and maybe skip a couple of the lives that really didn’t matter much. Overall, it’s fine but not great. Just ok. Maybe in the sequel she can actually live some interesting lives like bet on the stock market at the right time or something like that? At the very least figure out how to not date losers. Give us that! So what do you prefer a review like this after I’ve finished the book or a Teaser Tuesday while I’m in process? Let me know in the comments section. And if you are on goodreads follow me! Have any of you read Life After Life? What did you think? What are you reading these days? 2015 Animated Oscars: Did the Right Film Win?